Q: We live in a typical, Colonial-style house where the living room and dining room are an L-shape. The living room (13 feet by 19 feet 6 inches) has one large picture window with an entry from the foyer and one into the dining room. 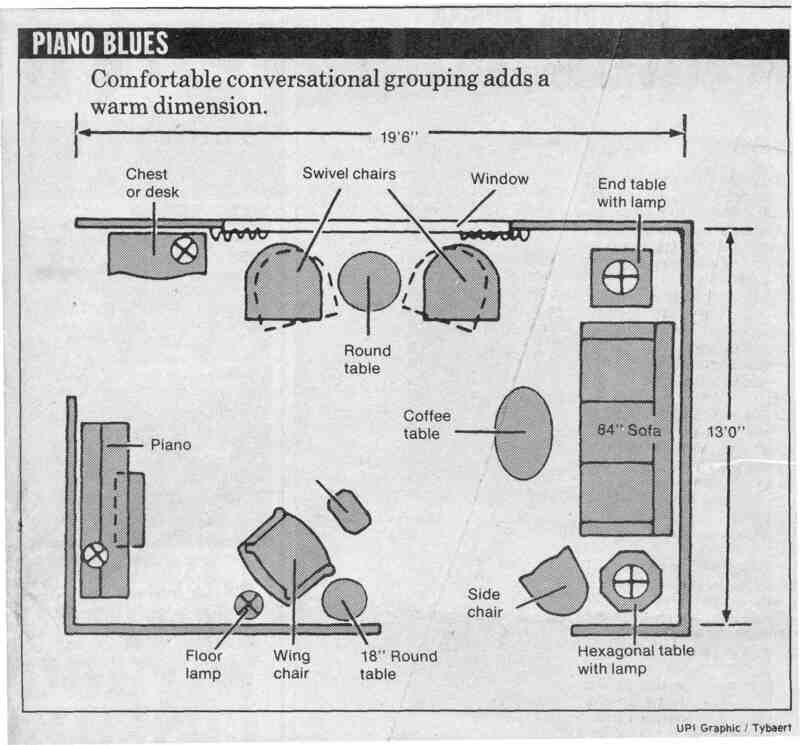 The room is too large to put all the furniture against the walls and create a comfortable conversational grouping, but it seems too small to subdivide it. I want to use an upright piaÂ­no, a sofa, a small side chair and a wing chair with a foot stool. I am flexible about my other choices of furnishings, but need to seat a minimum of six people. I need some direction for an appropriate layout. A: I see many homes with similar "L-shaped" living and dining rooms. The sizes may vary, but the basics that you mentioned are fairly standard. 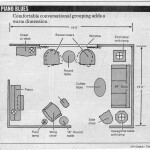 Even though it is a typical floor plan, these rooms are not always the easiest to arrange. Yours, being larger than most, is a good example. In laying it out, I began with the furniture that you want to use. The piano, more functional than aesthetic, should be positioned on an inside wall, and not interfere with the seating arrangement. With that in mind, I would put it to the left of the entry into the foyer. That wall, being so far from the other end of the room, would not be used for seating and is the appropriate place for the piano. Center the sofa on the end wall. Your other option would have been to position it in front of the window, but that would emphasize the length of the room, which you wouldn't want to do. Placing it on the end wall makes the room appear wider. either end of the sofa, put an end table with a lamp. The side chair then would be angled to the right of the sofa, and an oval table placed in front of it. chair into the room and put a small round table to its left. A standing floor lamp behind it would provide light for reading. the chairs for reading. There is adeÂ­quate light in the room, and when possible, I always try to avoid placÂ­ing a lamp in front of a picture winÂ­dow. It is far more attractive when the view is left unobstructed. The swivel chairs provide the flexibility of being able to turn them in any direction. With this furniture arrangement that would be an attractive feature. grouping and you easily will be able to seat six people.